Hosting firms have been given a heads-up about some double-digit price hikes due at the start of next year and the year after. While Microsoft has been slashing the price of its Surface hardware amid a $900m write-down, the price of its software has headed north. The Services Provider Licensing Agreement (SPLA) is the latest area to get the special treatment, with hosting companies warned that from January next year Windows Server Datacenter will rise by 38 per cent under the per-processor licensing model, and by another 13 per cent from 2015. A channel source told us that there is "some logic" in Microsoft's move here, as the licence will accommodate unlimited virtual machines whereas it used to be restricted to four. But he added that he thought the extent of the global price rise was "silly". 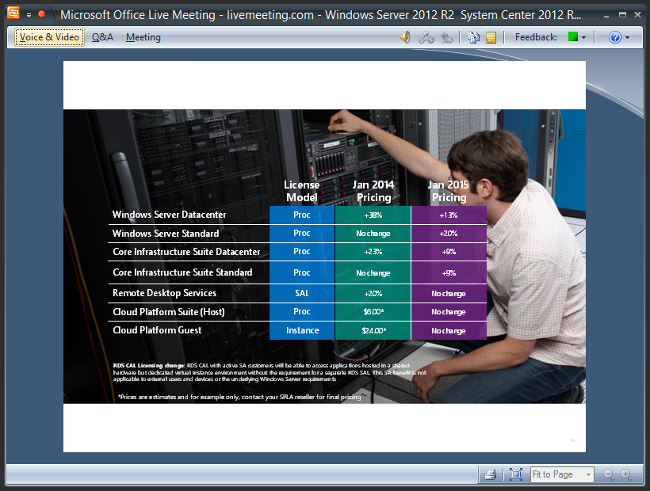 The price of the Windows Server Standard edition will not change in January but will go up by one-fifth from January 2015. Core Infrastructure Suite Datacenter is set to increase by 23 per cent from 2014 and nine per cent the following year, and the Standard version will edge up nine per cent from 2015. The Remote Desktop Services Subscriber Access License (SAL) will become 20 per cent more expensive from January. The Cloud Platform Suite and Platform Guest will not be impacted by price surge. Hosting firms that buy Microsoft's wares under SPLA already had to deal with a 33.4 price rise at the start of this year, and one told us the latest change would be a "hard sell" to customers. "We can't constructively work with Microsoft if it keeps putting up its prices," bemoaned one, who added that in markets where Microsoft has more competition, as it does with Azure in the cloud-hosting game, price cuts were common. Microsoft last year increased volume licensing prices for UK customers as it harmonised the list price across Europe in line with the euro. Earlier this year it pushed up prices of BizTalk server, in the Azure cloud, and the cost of Client Access Licences was bumped up last Christmas.